GitHub - stephenfewer/grinder: Grinder is a system to automate the fuzzing of web browsers and the management of a large number of crashes. 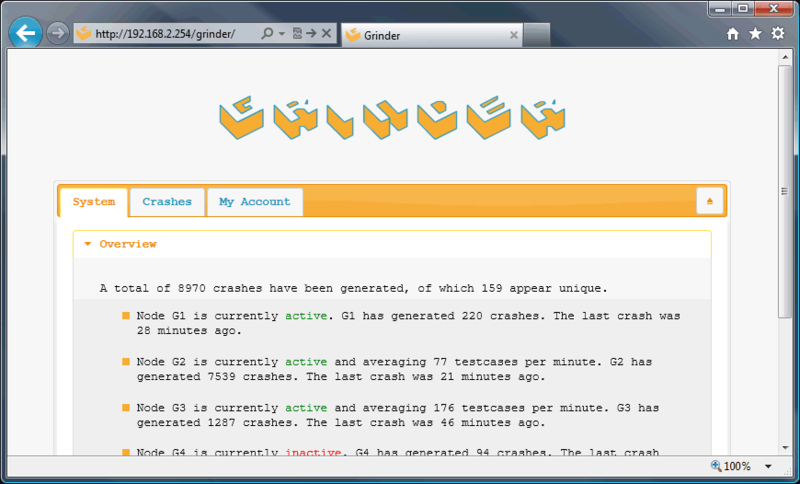 Grinder is a system to automate the fuzzing of web browsers and the management of a large number of crashes. Want to be notified of new releases in stephenfewer/grinder? A Grinder Node requires a 32/64 bit Windows system and Ruby 2.0 (Ruby 1.9 is also supported but you wont be able to fuzz 64bit targets). A Grinder Server requires a web server with MySQL and PHP. A node records useful crash information such as call stack, stack dump, code dump and register info and also includes any available symbol information. A node can automatically report new crashes to a remote Grinder Server. A node can run largely unattended for a long period of time. Grinder does not include any fuzzers for the Grinder Nodes and you will need to write your own. However a very simple example fuzzer is included (.\grinder\node\fuzzer\SimpleExample.html) to show how to begin writing suitable fuzzers for use with Grinder. Copy the contents of .\grinder\server\ over the the web server. When installing, the 'Grinder Key' used must be the same as the one written in all the Grinder Nodes config.rb files (see below). Install Ruby (www.ruby-lang.org). Ruby 2.0 x64 can fuzz both 32bit and 64bit targets. Ruby 2.0 x86 and Ruby 1.9 x86 can only fuzz 32bit targets. When a Grinder Node generates a crash in a browser, two files are created within the .\grinder\node\crashes\ directory. The contents of these files are also transmitted to the remote Grinder Server. The .crash file contains useful debugging information (call stack, disassembly, register info, and so on), while the .log file contains the logging information generated by the fuzzer which can be used to generate a reproducible testcase so you can trigger the crash again. As this information is sensitive in nature it is useful (and recommended) to encrypt it. A Grinder Node can be configured to use an RSA public key to encrypt this information for storage both locally on the respective Node as well as for transmission and storage on the Grinder Server. Simply generate a suitable public key (details below) and edit the config.rb to use this key. 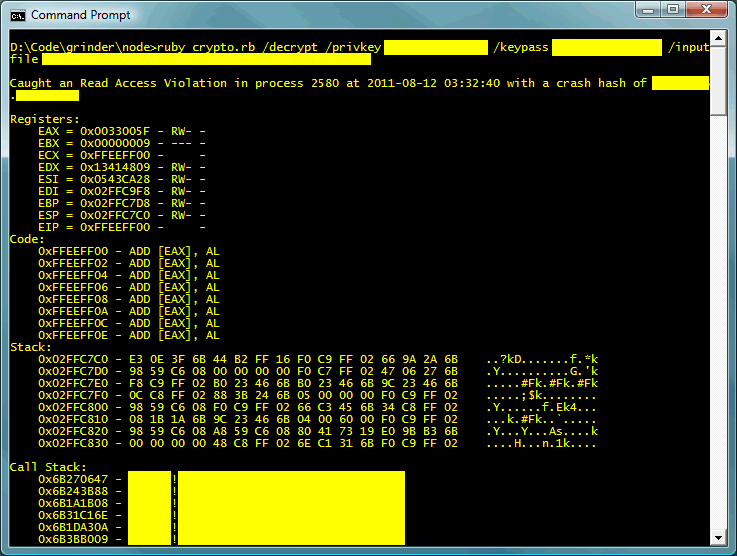 Now when you download the crash/log files from the Grinder Server you will need to decrypt them before you can use them. The generated public key will need to be copied over to all the Grinder Nodes while the private key will need to be stored securely on the analyst's workstations. When you have generated a crash and downloaded the log/crash files you can use the testcase.rb utility to transform the .log file into a html file that will (hopefully) reproduce the crash. Depending on how you write your fuzzers you may need to modify testcase.rb to suit or edit the testcase options ($testcase_opts) in your config file. If the testcase does not reproduce the crash it is useful to create an 'Alert' within the Grinder Server to alert you by email whenever the same crash is encountered again. Using a different log file for the same crash may help reproduce it. Please submit all code contributions as pull requests via GitHub, thanks!. If you find Grinder useful, please consider a Bitcoin donation to 12cS37zQSvAGEokQJfWzhwyeGPBA2SwCxQ, thanks! Grinder is licensed under a 3 clause BSD license. Please see the full text of this license in the .\grinder\LICENSE.txt file.